The Riverside Park Bandshell is located in Riverside Park, established in 1909, along the Rock River. 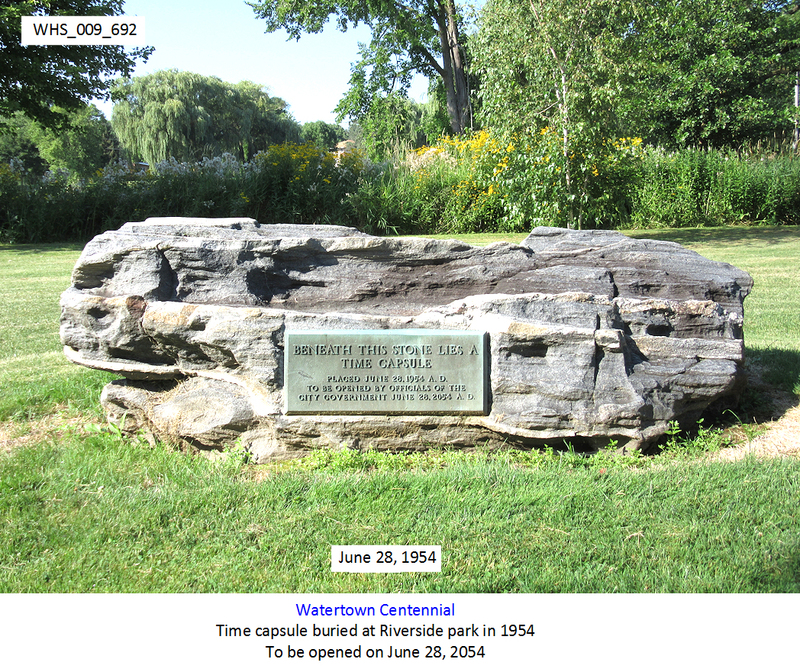 The Watertown Historical Society (WHS) has a very detailed history of the park. According to WHS, the new bandshell was dedicated in 1954. It was constructed by Wilbur Wollin, a local contractor, and made of concrete, wood and stone. The bid price was $20,263; funds were used from the Wenzel Prochazka estate which stated his desire for it to be used for the park. In 1954, a time capsule was buried near the bandshell and to be opened in 100 years. In 2001, a "suspicious" fire occurred at the bandshell. There was approximately $30,000 in damage. Described by the WHS, "The fire, which started in the first floor area and extended into the walls and roof of the band shell, was reported by a citizen who saw the smoke at 6:59 p.m. Five hundred gallons of water and fire fighting foam, containing an extinguishing agent, were used to put out the fire which kept 22 firefighters on the scene for 2 1/2 hours. 'Smoke was just pouring out of the roof area and eastern most side of the structure,' said Watertown Fire Chief Henry Butts. 'Flames were visible for a short period of time but there was thick black smoke and you could hear the fire burning in the walls,' Butts said. Two engines, one ladder and an EMS team also responded to the fire. No one was injured in the incident. 'The structure had a good amount of fire damage and will have a significant amount when we’re done,' said Butts. " Insurance covered most of the cost to repair the bandshell with the Watertown Park Department crew doing most of them. Today, the municipal band offers free concerts weekly at the bandshell during the summer season. A highlight is the annual Riverfest, held in August. Other events in the park include an island gazebo​ where weddings are often held and a weekly summer farmers market. A plaque is set in a rock directly across from the bandshell which pays homage to Mr. and Mrs. Robert E. Lewis. The death of Mr. Lewis was most sincerely regretted here, for his was one of Watertown's most esteemed citizens, and during his residence among us he always took a great interest in the welfare of our city and its citizens, devoting generously of his means to every public enterprise and bestowing charity and benevolence in many ways, in which he was always encouraged and aided by his devoted wife.